Whether you're prepping for bikini season or just want a toned, tight stomach all year-round, you'll have to adjust your lifestyle to get the physique you want. You can drop belly fat with a well-planned diet, but food can't strengthen and tighten your stomach muscles. To tighten your stomach, combine a healthy diet with a total-body strength-training regimen that emphasizes core work. A calorie deficit helps you lose the extra fat covering your ab muscles. If you trim 250 to 1,000 calories from the amount of calories you need to maintain your current size, you can expect to lose between 1/2 and 2 pounds per week. Estimate your calorie needs with an online calculator; then subtract calories to come up with an intake for weight loss. Too low of a calorie intake can be counterproductive, though, as it could lead to frustrating feelings of deprivation, muscle loss and nutrient deficiencies. Aim to eat a minimum of 1,200 calories if you're a woman or 1,800 if you're a man. A moderate deficit and gradual weight loss is safest and most sustainable. A diet that contains lots of fibrous vegetables, fruits, lean proteins and whole grains encourages a slimmer stomach. The protein supports efforts to build muscle, which supports a higher metabolism. Muscle requires more energy to sustain. The more muscle you have, the more efficiently your body uses calories so you lose weight. Vegetables and whole grains provide you with fiber, which helps you feel full for longer so you're less likely to overeat. The fiber also helps your digestive tract work smoothly, which helps prevent bloating. Low-fat dairy is another important part of a stomach-flattening regimen. Yogurt, cottage cheese and milk provide protein, but the calcium also contributes to a slimmer belly. Pre-menopausal women who regularly consumed calcium over the course of a year experienced less accumulation of visceral fat, showed a 2010 study published in Obesity. 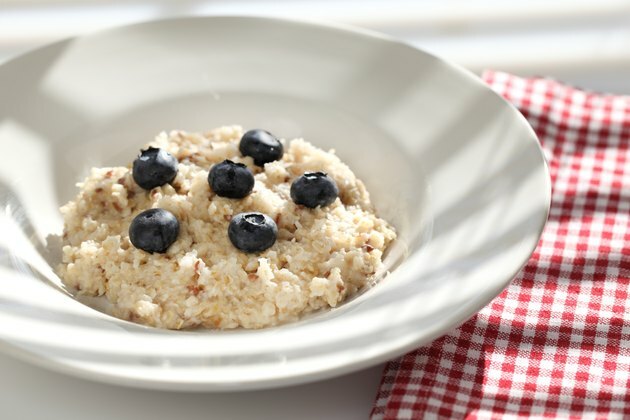 Meals that support your stomach-tightening goal include oatmeal with blueberries, skim milk and walnuts; roasted salmon with a raw green salad and brown rice; or roasted chicken breast with butternut squash and steamed asparagus. A serving of nuts, equal to 1/2 to 1 ounce, fresh fruit, Greek yogurt, low-fat string cheese and hard-boiled eggs make quality snack choices. Add high-quality, high-fiber and nutritious foods to crowd out foods that encourage you to gain belly fat. Excessive sugar from processed foods, including candy, sweets, ice cream and pastries pads your diet with calories that are often stored as visceral fat. Soda drinkers who gulp daily are more likely to store belly fat, too, showed a 2016 study of 1,000 participants published in Circulation. Whole grains replace refined grains when you're trying to keep your stomach from accumulating excess fat. Increased intake of whole grains did not lead to the same belly fat gains that eating more refined grains did, showed a 2010 study published in the American Journal of Clinical Nutrition. Have 100-percent whole-wheat bread or brown rice instead of the white versions. Too much saturated fat, found in full-fat dairy and fatty meats, as well as trans fats, found in processed and fast foods, also encourage the development of visceral fat. Stick to lean cuts of meat, low-fat dairy and fresh snacks, such as fruit and raw nuts. Cardiovascular exercise helps you burn calories and lose fat. Aim for a minimum of 150 minutes per week of moderate-intensity activity, such as brisk walking. Go for at least 250 minutes per week to lose significant weight, suggests the American College of Sports Medicine. Resistance training helps you build more muscle mass, which improves your body's ratio of lean mass to fat. Plus, a leaner body appears tighter and tauter. Aim for a minimum of two resistance-training sessions per week, but don't just focus on your abs. A total body routine that includes all the major muscle groups, including the chest, back, hips, arms, shoulders and legs, helps you build a balanced physique that supports a tighter tummy. Crunches, planks and core rotations help build strong abdominal muscles to protect your back and improve your posture. They also help tighten the muscles that lie under any excess fat you're carrying in your middle. But, no specific abdominal exercise directly reduces stomach fat. Train your abs as part of your total-body routine. Focus on your form and pull the belly in slightly as you perform crunches and planks to elicit the most muscle activation.